Gold is getting another boost, this time from Japan Prime Minister Shinzo Abe. Prices are headed for the longest rally in more than six weeks after Japan’s cabinet Tuesday approved a spending-and-lending package, including 4.6 trillion yen in outlays this year. The dollar also weakened, boosting the appeal of the metal as an alternative investment. Bullion futures have rallied 29 percent this year amid mounting speculation that central banks including the Federal Reserve will be slow to raise interest rates. Investors chased better returns in precious metals as monetary policies from Japan to Europe push yields on about $9 trillion of sovereign bonds in developed markets below zero. Gold futures for December delivery gained 0.9 percent to $1,372.40 an ounce at 10:06 a.m. on the Comex in New York, poised for a sixth straight advance in the longest run since June 16. Producers are positive on prices. Fresnillo Plc, the biggest primary silver producer, says gains for precious metals will be sustained, while Australian gold miner Northern Star Resources Ltd.’s Bill Beament sees a longer-term uptrend. 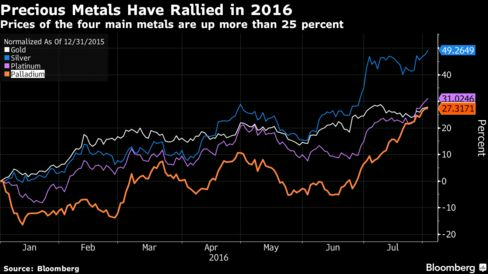 A Bloomberg Intelligence gauge of 14 senior global gold producers advanced 2.8 percent to the highest since 2013. Kinross Gold Corp. and Barrick Gold Corp. were among the biggest gainers. “We were expecting something from Japan, and these things all contribute to a more supportive environment for gold,” Dan Smith, a commodities analyst at Oxford Economics Ltd. in London, said by phone. Holdings in exchange-traded funds backed by gold added 8.4 metric tons to 2,016.1 tons on Monday, data compiled by Bloomberg show. That’s the highest since July 2013. October platinum futures climbed to the highest for a most-active contract since April 2015 on the New York Mercantile Exchange, while palladium advanced to the highest since October. Silver futures also gained on the Comex.